*How has the concept of 'the audience' changed over the past 50 years? *How do audiences become producers and not just consumers of media texts? *How are new media affecting the ways in which audiences are researched? 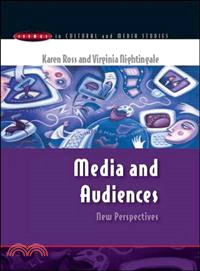 The audience has been a central concept in both in media and cultural studies for some considerable time, not least because there seems little point exploring forms of increasingly global communication in terms of their content if the targets of media messages are not also the focus of study. This book ranges across a wide literature, taking both a chronological as well as thematic approach, in order to explore the ways in which the audience, as an analytical concept has changed, as well as examining the relationships which audiences have with texts and the ways in which they exert their power as consumers. We also look at the political economy of audiences and the ways in which they are 'delivered' to advertisers as well as attending to the ratings war being waged by broadcasters and the development of narrowcasting and niche audiences. Finally, the book looks ahead to the future of audience research, suggesting that new genres such as 'reality TV' and new ICTs such as the internet, are already revolutionising the way in which research with audiences is taking place in the 21st century, not least because of the level of interactivity enabled by new media.